In an attempt to comment upon the repeated violations of free speech and the rise in governmental prosecution of journalists in Turkey, two Turkish cartoonists themselves narrowly avoided a prison sentence this past week for their cartoon on the cover of Penguen magazine — a publication know for its often scathing political satire. 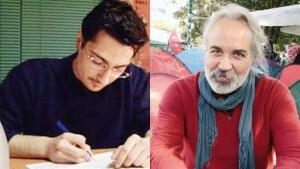 The cover published on the magazine directly following the election of Prime Minister Erdoğan ultimately resulted in an initial prison sentence of 11 months and 20 days for cartoonists Bahadır Baruter and Ozer Aydogan. It is not, however, for the cartoon’s explicit comment on the abuse of journalists by the Turkish government that these cartoonists where prosecuted, but rather for what Erdoğan misinterpreted as a comment on his sexuality. In the cartoon, Prime Minister Erdoğan is standing next to other state officials and he makes the comment, “What a bland celebration. We could have at least sacrificed a journalist [to eat].” The cartoon clearly comments on Turkey’s treatment of journalists, but it instead Erdoğan took exception to a simple hand gesture that the man shaking his hand is making, which supposedly implies that Erdoğan is homosexual. This element, though, was never intended to be a part of the cartoon. “The magazine would not make such a cheap joke on the cover. The joke on the cover is a metaphor for the victimization of journalists,” Aydogan argued. As part of their defense, both artists commented that the point of the cartoon was to show the mismanagement of free speech in Turkey; resorting to crass humor about sexuality would undermine the poignancy of the cartoon’s intended message. This being said, following further investigation the prison sentence for both cartoonists was dropped and they have instead been instructed to pay US $2,700 as recompense. Sadly this gross misinterpretation of the cartoonists’ work and the subsequent legal action being taken against them has become commonplace in Turkey. Last year, Erdoğan filed a criminal complaint against political cartoonist Musa Kart for a cartoon about the Prime Minister’s compliance in governmental corruption — a complaint that was eventually acquitted. Protests against the implementation of stricter internet laws resulted in arrests of several journalists, screenwriters, and other media agents. According to the media activist groups Bianet and Al Jazerra, it is estimated that 19 journalists are currently serving prison sentences in Turkey for their work, and about 150 are awaiting trial. Needless to say, the Turkish government has quickly come under global scrutiny for its restrictive and abusive treatment of free speech and the ways in which it takes judicial action against those who choose to express themselves.